Thanks to you who responded, I feel like it was a pretty positive response! I’ve decided to move forward with this idea. I will be making that, minus the thing that goes on top (the ‘gym’ part.) 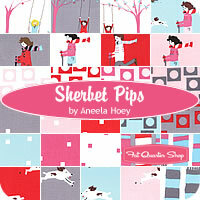 But as I said before, I’d add some ribbon ‘taggies’ and loops for adding links and toys, etc. The bottom is just fabric, no batting in between. I actually use this all the time (without the gym), since it’s the perfect thing to take outside. It’s soft enough to put on concrete and have the baby lay on while my toddler runs around. And since it’s not super fancy, I’m totally not worried about it getting dirty. I LOVE it. I think I want to use charm packs for the squares, since they seem perfect for this. If you were going to purchase one, which do you like the best? I'm practical that way. Looking forward to seeing the end result. Love the idea. I have the same collapsable play mat. 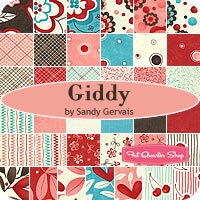 I love the GIDDY fabric. I've always heard that babies see stark contrast really well, and this has nice contrast. Love that it's not too "busy" in terms of color. A simple palette. Oh my goodness! This is so awesome!! 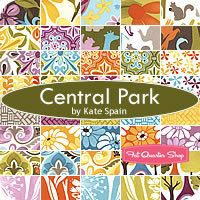 I like Central Park, Giddy, Lilly and Will and Lollipop. I like all the packs really but the 4 I mentioned are my absolute favorite out of what you have here!!!! I love the "Giddy" pack, or the Lily and will II ones the very best. Very cute! 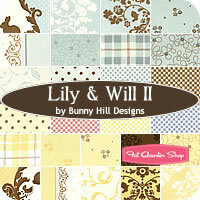 definitely the lily and will II !!! 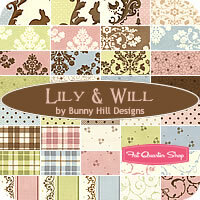 LOVE LOVE LOVE this super cute quilt! Of your choices, I would choose Giddy. 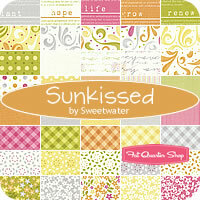 However, I just received a layer cake of Sugar Pop, and I think that would be adorable too! I missed the original post about this, but OMG it's gorgeous! Almost too pretty to have my son spit up on, but amazingly pretty! Do want in Giddy or It's a Hoot! This is great idea, people are going to love it! 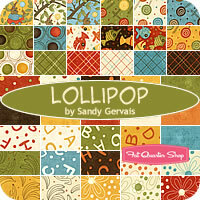 My favorite fabrics are the Lollipop and Wee Woodland. btw, I love your tutorials on the puff quilt. Once the Christmas season is done I'm making those for my girls beds. Lollipop is my top choice, but they are all so dang cute! I LOVE this idea! I think your quilts are amazing and the idea of a smaller play mat is genius! 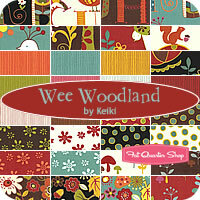 Wee Woodland matches my nursery theme & colors if you can believe it! I want one! Umm. . . seriously? How am I supposed to choose a favorite from all those cute charm packs?? 🙂 I love them all! But I must say, I REALLY love Central Park, Lily and Will and Sunkissed. But in all honesty, you could go with any of them and they would look adorable. Such a good idea, I think I might need to invest in one for my little lady! 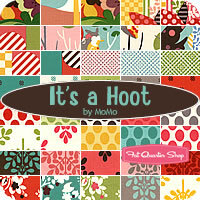 LOVE them all – – I lean towards bright colors, so maybe my favorite is The Hoots – but really, all are great! Lollipop or Wee Woodland or Giddy… really they are all quite nice. The bolder the better for baby I think since the darker patterns are more interesting for them. giddy or either one of the lily and will, it's a hoot is cute too..
Wee Woodland, Lollipop or It's A Hoot are my favorite.